I like flags; I don't know why but I do. I like seeing them flying around town, I like seeing them at football matches. 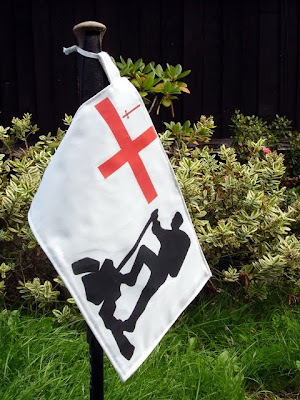 So I want a flag of my own but not just a run of the mill, England or Union flag but one that represents me. The cost of having a custom flag made is quite expensive, so I went down the DIY route. the only real way of doing this was to use iron-on transfer paper but using this in the past the results have never really been that good. Searching the 'net I found a company selling a new type of transfer paper and after watching their video's, it looked it would do the job. Next up was finding a design the linked to me and my name; the backpacker part was easy enough to work out and do. The London part seemed a bit more of a challenge, until I realised that London has its own flag. So combining these two elements I came up with the London Backpacker flag. The transfer is printed on linen cloth and is double sided, and the size is roughly 11 x 8 in. The idea is to attach it to one of the walking poles when camping, I may also attach it to my pack and let it fly whilst I walking. It may be a commercial product, but I'm partial to "pack flamingos"